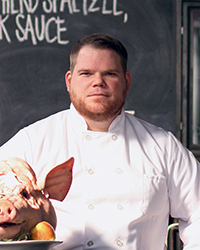 Why He's Amazing: Because he and his co-chef Phillip Perrow are enlivening Richmond's food scene with unexpected ingredient combinations like spiced pork rillettes with honey-roasted nuts, pig's skin corn bread and pickled squash. Where He's From: Shriver grew up in Yukon, Oklahoma. How He Got into Cooking: "My mom always cooked, always made me and my brothers help…. I might not have been doing a lot, but it had a lot of influence on me—how food could be special, watching her cook and helping her. She'd do baked ham, chili and apple pie." Grill Masters: On Saturdays, the pair serves their weekly changing house-made All-American hot dogs (one past concoction was a French Dip hot dog with smoky beef jus) and not-so-American stroopwafels for dessert. You can also buy packages of each week's franks to grill in your own backyard.